Six, read'em, six ports on an iPad! 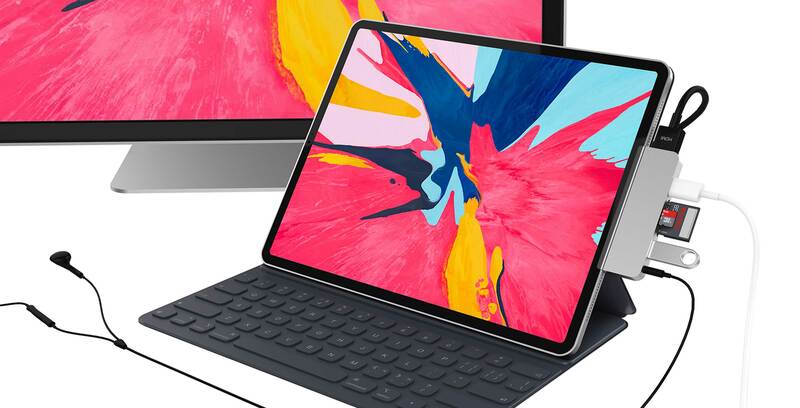 Apple’s new iPad Pro ditches the proprietary Lightning connector in favour of USB-type C — and now you can preorder a USB-C hub that adds six external ports to the new iPad Pro. The hub is called the HyperDrive for iPad, and it’s the latest product from the accessory company Hyper. The side that mounts to the iPad features a removable soft polycarbonate bumper, allowing the hub to sit flush along the side of the iPad. That said, Apple hasn’t built default support for all of these ports into iOS. For example, the USB flash drive that’s featured in the HyperDrive’s product images will only work to transfer photos onto the iPad. The HDMI port only mirrors the display, unless the app it’s being used with supports extended display functionality. Having a hub like this is useful and opens up many possibilities for iPad Pro users, but make sure that the tablet or the app you’re planning to use supports external devices before you buy it. HyperDrive for iPad comes in either ‘Silver’ or ‘Space Gray.’ The adapter is priced at $99 USD ($129 CAD), but anyone who preorders the accessory can get it for 50 percent off.